In New Zealand, they get into mid-summer. A new report from Arisa Odagiri, an exchange student who is studying at New Plymouth Girls High School. Today I would like to share my updated report with you. Hi everyone! I’m Arisa Odagiri. I’m an exchange student at New Plymouth Girls’ High School in New Zealand. I have been staying here in NZ for 7 mounts now. Sometimes it has been raining and a bit cold, but it is possible for us to spend almost all day long with short sleeve. I did a lot of things with other exchange students recently. Today I will write about what I did in these days. I didn’t have exams, but I went to school every day, which means that I stayed at school just in the morning time. We made a children’s story book, children’s cards and my photo book. As for the children’s storybook, I wrote the story which I have already knows onto the book and put some pictures with the story on the book. I made such a kind of book before at school, but I did it in Japanese and with hand writing, so I did not think it was so hard. On the other hand, this one was in English and I had to use a computer, so I found it a bit hard. But I think that it will be one of my great memories because I have never had such an opportunity to make a book. We would teach numbers, colors and family members’ names with special cards in Japanese or German. We were supposed to go to a kindergarten and teach something for its children, but we couldn’t do that. It was so regret, but I am going to volunteer at the kindergarten to play with children in the summer holidays. For the next thing I want to write about, I went to the Oakura beach with exchange students. We experienced special cuisine by cooking with hot stone. 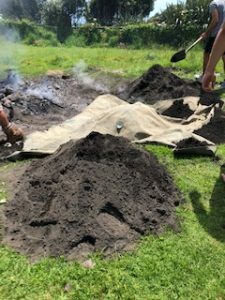 We put the hot stone and foodstuff into the ground for cooking, which is called, “Hangi”. In addition, girls there made poi and learned poi dance. Boys learned the Haka, which is a ceremonial dance or a ceremony to challenge something in Maori culture. We learned a lot of Maori tradition and did the performance for teachers and some host family’s. It was a good experience as I can’t learn them unless I joined such opportunities. Next, I surfed with international students. At the beginning it was difficult and I could not get on the wave, so I drank the sea water, which made me taste salty. But as I was surfing several times, I got to ride a little. 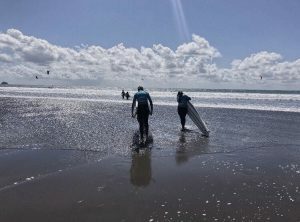 I had never been to go surfing because the sea was far away from my house in Japan, so it was good to do that in this great opportunity. 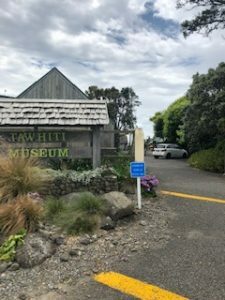 Finally, we went the Tawhiti museum. This museum is where we can see some models and photos of the old Maori and old machines they used. It was so cool. I had been to this museum before, but I had not ridden on a boat. So, it was good to do that this time. Everything was so fun because I have never experienced almost all of what I do here. Meanwhile, I know that there will be so much for me to do during this stay in New Zealand. I would like to do everything as much as possible.